I am mildly arachnophobic, which I reportedly share with up to 55% of western women and 18% of western men. But none of those things really interfere with my day to day or professional life. The number one thing I am afraid of is that when all is said and done, what I have done won’t make a lasting difference. As a parent, I worry about the impact I have on my kids, and how I can make sure that they become all that they can be. We are all doing it (parenting that is) for the first time, without a backup plan. To counteract my fear, I long ago wrote myself a guideline for the kinds of adults I hope my kids will become : caring, nurturing, intelligent, questioning, hard working etc. It made me realise the values I wanted to instill in my kids and the personality traits I would most admire in them as adults. The minor arguments and challenges over things that don’t really matter; like finishing all the food on their plate, drinking another can of pop or what clothes they wear, now get weighed against how that particular battle will contribute to the kind of adult they will become. Having a goal-plan allows me to focus on the bigger picture and not get drawn into every little scrap. From a professional standpoint, and as leaders, we all need to learn to do the same. Focus on the bigger picture and allow the noise and distractions that happen around us every day to colour our actions only to the extent they have an impact on our future. The other thing I am afraid of is getting too comfortable and set in my ways. The more success we achieve professionally, the more vital it is to acknowledge the enormous value of learning and stretching in areas where you are least comfortable. Paradoxically, it is also when we feel most pressure to be infallible. As a Director, VP or even a C-Level executive, you still cannot afford to stop learning and growing from those around you. That said, you do need to maintain a presence with your followers which inspires their confidence and loyal commitment. Over the last few years I have done a few things to ensure that I don’t fall prey to the silencing pressure of my own accomplishments. I have worked with external mentors to candidly explore areas where I could stretch and grow. My mentors have ranged from those I have worked with in the past to those I have actively sought out to purposefully chart unmapped areas of expertise. I have placed myself in relationships of trust to openly discuss where inexperience and hesitancy might be holding me back. The value of a third party perspective to the learning opportunities you might find yourself in enable you to extrapolate to general rules and methods to use again and again. Some of the best learning opportunities come from facing fear and pushing yourself all the way to the point of failure! Only then do you know just how far you can go. That is why many of us put ourselves in extreme situations, to see just how capable we really are. I do this in my life by taking on new skills outside of my professional capacity, to stay grounded to the need to learn and grow. The skill I took on this year was speed-skating. My son took up the sport in 2009 and I decided it was time for mum to stop sitting in the stands and start taking a more active interest. 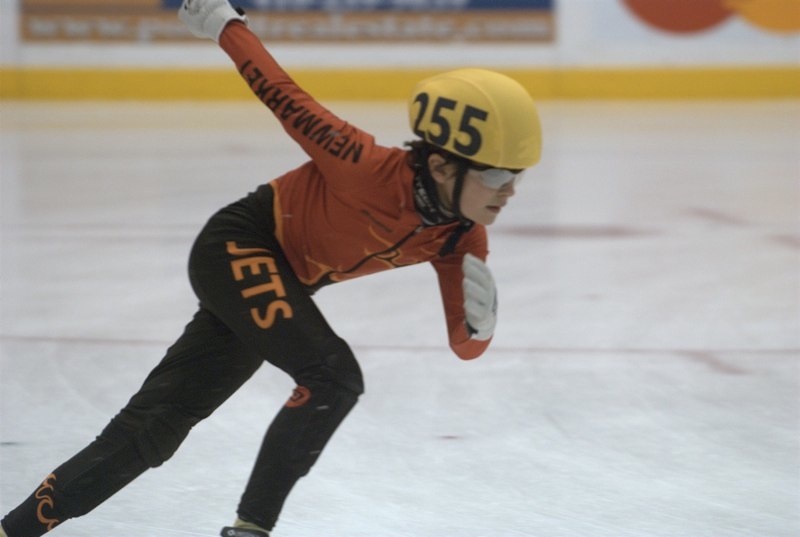 Our club has members from age 6 to 78 and one of our older skaters only started speed skating at age 70 and went on to win a slew of medals! Having barely strapped on a pair of skates before, I took to the ice last September. I cannot profess to be record-breaking fast, but a few months later I am proudly traversing the ice in crouched position with smooth sideways strokes and cross-overs, accomplished only because I learned to let go and push myself to beyond the point of failure (with several bruises to show for it)! Next year I may even quell my fears long enough to enter a race or two! I find learning new skills where I have to fail in order to succeed a great lesson in humility and a constant reminder to stay fresh in my thinking at work. How can I push past the point of comfort to unveil new methods. What’s my workplace equivalent of Go Fast, Turn Left…? Truth 2. The only way to get rid of the fear of doing something is to go out and do it. Truth 3. The only way to feel better about myself is to go out and do it. Truth 4. Not only am I going to experience fear whenever I’m on unfamiliar territory, but so is everyone else. Truth 5. Pushing through fear is less frightening than living with the underlying fear that comes from a feeling of helplessness. I am proud to fear… It inspires me to keep learning. How do your fears push you? I get a sense from your post that you’ve experienced and overcome a great many fears. I like the attitude that we can use fear to our advantage. Resiliency and resourcefulness are noble traits that will serve us well if we can muster the courage and drive to pursue them. Fear, along with so many other aspects of life is so uncomfortable and yet as you point out, it has the potential for causing us to grow far more than our comfort zone. Very inspiring Gabriella, thanks! Getting on ice skates alone is a tentative experience for me, so going off at speed (and potentially racing) is quite the feat. I think your theme of balancing the reliability of what we already do well with the challenges of things we fear is spot on. We can’t realistically go off and conquer all of our fears without losing a grounding in our current reality, yet we do need to make a conscious effort to step outside of our comfort zone throughout the year. Without doing so, it’s easy to stagnate and not improve. Learning by doing and experience are the best ways to keep ourselves fresh and improving. Your post is a great motivator and reality check along those lines. Cheers! Wow, Gaby, you’d let somebody stick a needle in your flesh while you’re not looking? In my book that’s brave, or at least trusting. I watch ’em like a hawk.